via station 2 mi. S.W. Location. 35° 38.93′ N, 77° 27.773′ W. Marker is in Greenville, North Carolina, in Pitt County. 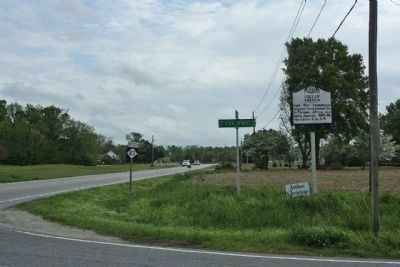 Marker is at the intersection of State Highway 43 and VOA Site C Road (State Highway 1212), on the right when traveling south on State Highway 43. Touch for map. Marker is in this post office area: Greenville NC 27834, United States of America. Touch for directions. Other nearby markers. At least 8 other markers are within 8 miles of this marker, measured as the crow flies. Sallie S. Cotten (approx. 2.1 miles away); Otter Creek Bridge Skirmish (approx. 4.2 miles away); Plank Road (approx. 5.2 miles away); Thomas J. Jarvis (approx. 5.4 miles away); a different marker also named Thomas J. Jarvis (approx. 5½ miles away); Baptist State Convention (approx. 5½ miles away); Greenville (approx. 5.8 miles away); Gen. Allen Hal Turnage (approx. 7.9 miles away). Touch for a list and map of all markers in Greenville. More. 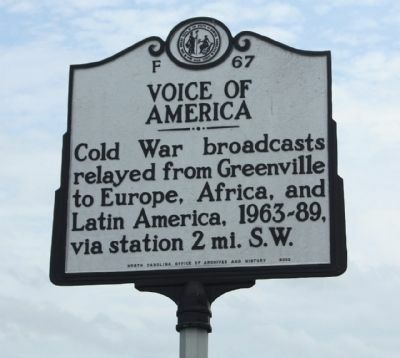 Search the internet for Voice Of America. Credits. This page was last revised on June 16, 2016. This page originally submitted on April 30, 2013, by Mike Stroud of Bluffton, South Carolina. This page has been viewed 452 times since then and 9 times this year. Photos: 1, 2. submitted on May 2, 2013, by Mike Stroud of Bluffton, South Carolina. Editor’s want-list for this marker. Photo of VOA antenna farm around East Carolina University (Old Site C). • Can you help?